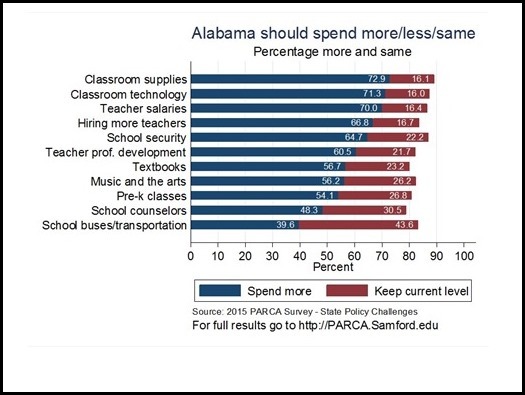 According to a new poll of public opinion commissioned by the Public Affairs Research Council of Alabama, state residents would be willing to pay more in taxes to avoid budget cuts in key areas like education, health care, and public safety. However, the public remains distrustful of government’s ability to spend tax dollars wisely. The results serve as a backdrop to PARCA’s annual meeting, Feb. 13 at the Harbert Center in Birmingham. The meeting will focus on initiatives by leaders in those key areas to improve public trust through goal-oriented planning, targeted investment, and the transparent tracking and reporting of results. The poll results are also relevant to lawmakers as they consider how to close a budget shortfall and improve budgeting practices. The survey of almost 600 Alabamians was conducted between January 5 and January 21. 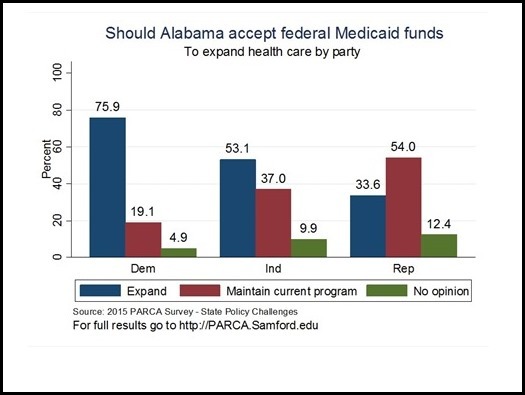 Each year, The Public Affairs Research Council of Alabama commissions a survey of public opinion to gauge Alabamian’s attitudes toward government and the issues facing the state. Randolph Horn, Samford University Professor of Political Science and Samford’s Director of Strategic and Applied Analysis, collaborated with PARCA on the design of the survey and directed the polling operation. The results were weighted to reflect the demographic makeup of the state. Text of the questions and results of the survey can be accessed here. You can find the survey results presented graphically here. 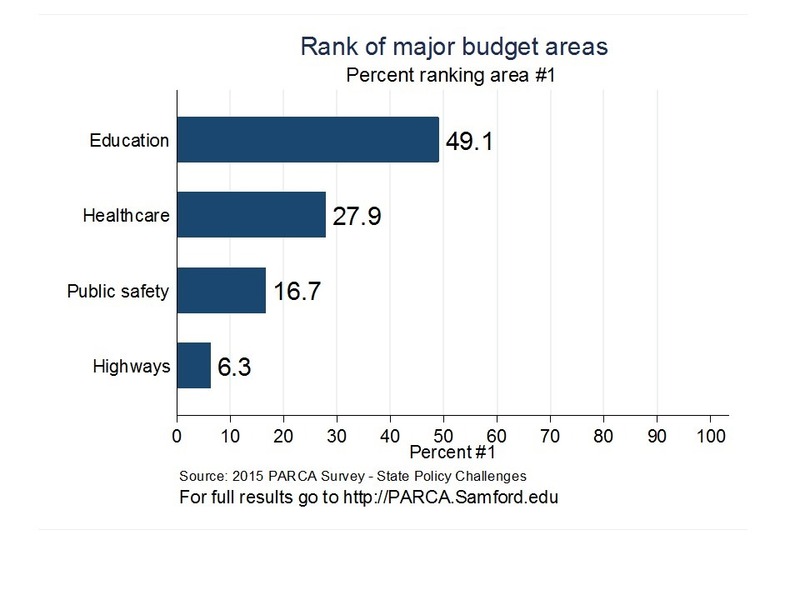 The PARCA poll found strong support for increased spending on a variety of educational priorities. It also found public support for more investment in rehabilitation of prisoners in the interest of cutting down on criminal recidivism. 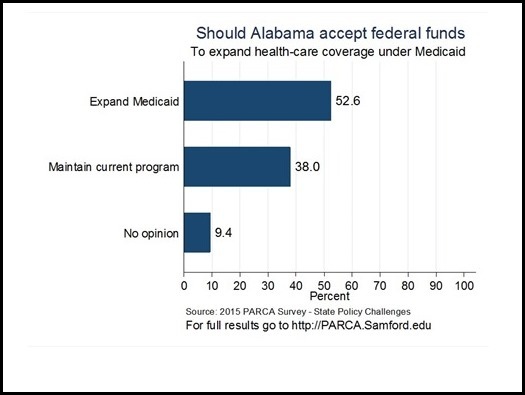 Also, a majority of those polled said they support expanding Medicaid to cover more low-income individuals, including childless adults. One of the most striking things about poll results is that, on a host of issues, there is broadly-based public consensus, a set of shared opinions that cut across demographic and partisan lines. 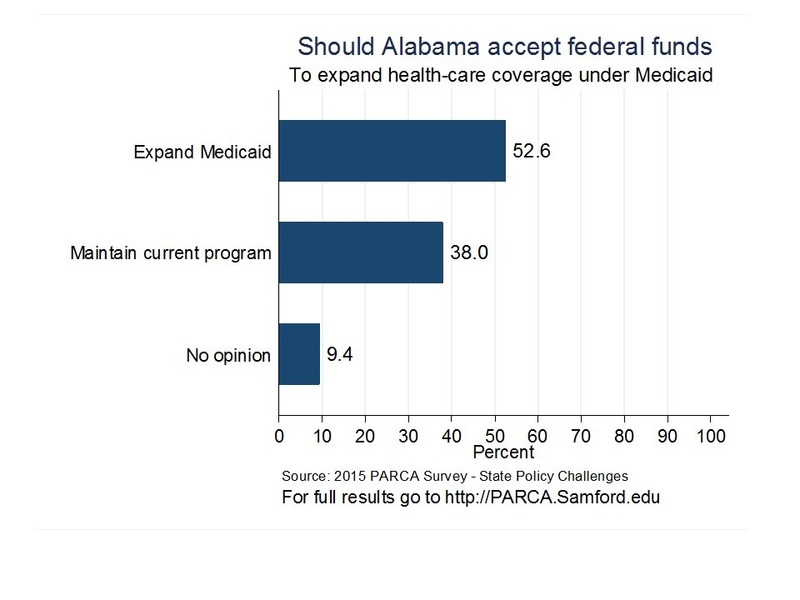 The one exception to that in this year’s poll, Medicaid expansion, is discussed below. The poll results contrast with the perception that voters are deeply divided along ideological lines. This year’s results are similar to the findings of PARCA polls in previous years, which have consistently found widely shared priorities. This year’s poll finds that among the four top areas of state expenditure — education, health care, public safety and highways — Alabamians rank education spending are the state’s most important area of investment. Health care comes in second. Public safety comes in third, with highways ranked fourth. 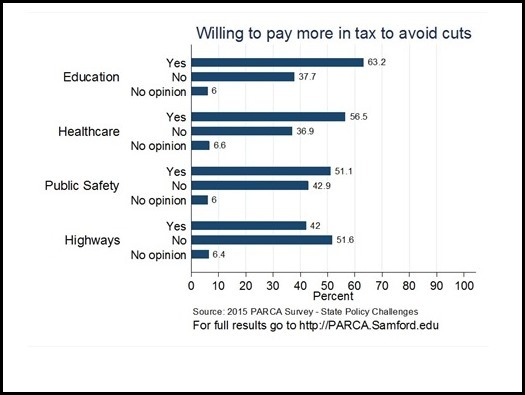 A strong majority of respondents said they’d be willing to pay more in taxes to avoid cuts in public education (63 percent) and health care (57 percent). 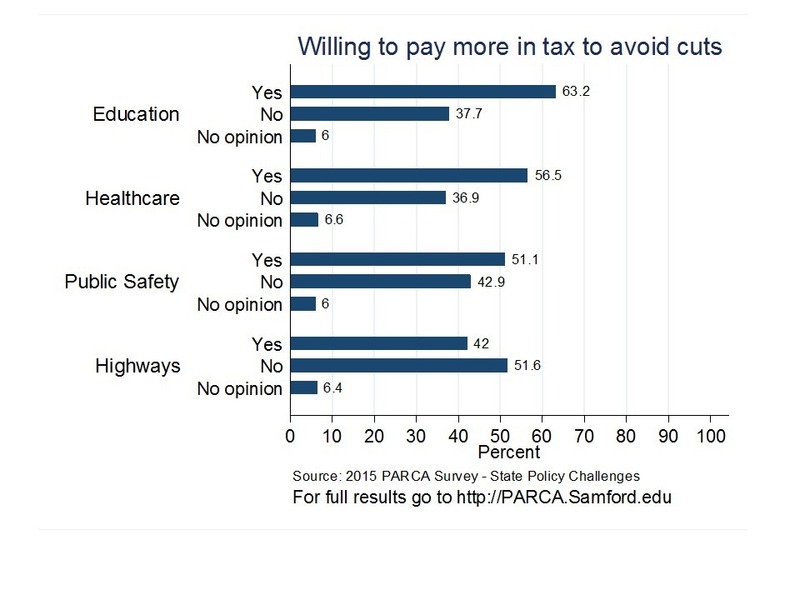 A majority said they would be willing to pay more in taxes to avoid cuts in public safety. Focusing on education, the poll found that 79 percent of Alabamians believe that the level of funding in schools does make a difference in the quality of education provided. 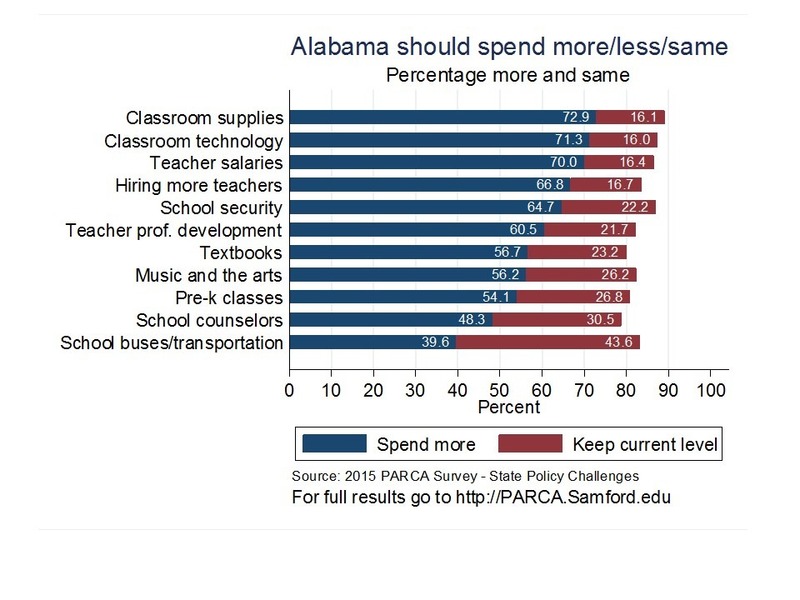 And 67 percent believe that too little is being spent on public education in Alabama. However, 63 percent of those polled said they thought that the money that currently goes to education is not being spent properly. Some of that sentiment may reflect Alabamian’s general distrust of government. However, in past PARCA surveys, further questioning on this subject revealed that some of that perception of improper spending stems from factors linked to inadequate spending. For instance, respondents pointed to old and tattered textbooks or parents having to pay for classroom supplies as evidence that money in education was not being properly spent. Strong majorities of those polled believed that more money should be spent in schools in a variety of categories and that the state should play a role in equalizing funding for school systems that lack resources. 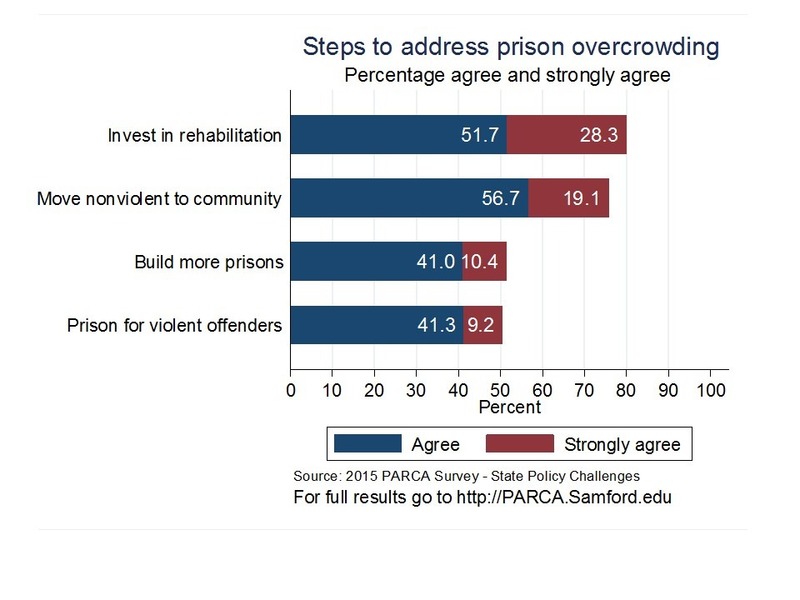 Turning to corrections, the poll indicates the public believes we should be doing a better job of rehabilitating prisoners than we are currently doing. 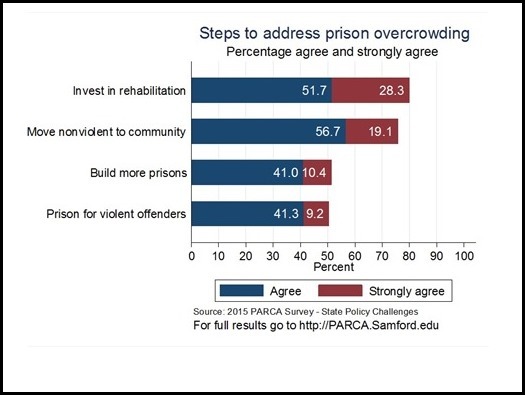 As the state grapples with a prison overcrowding problem, public support for increased investment in rehabilitation and treatment is stronger than support for simply building more prison space. On Medicaid, there was almost universal agreement (95 percent of those polled) that the state should provide a medical safety net for low-income children, pregnant mothers, and seniors. A majority of those polled said they supported expanding Medicaid by taking advantage of federal incentives to help pay for the extension of health coverage to low-income adults, who are currently not covered. However, it should be noted that this was the one question in the survey that produced a division along party lines. Nearly 76 percent of those identifying themselves as Democrats favored expansion, and expansion was supported by 53 percent of those who classified themselves as either independents or as having no partisan affiliation. However, among Republicans, 54 percent supported keeping Alabama Medicaid as it currently is, rather than expanding it.